Hollow State, a north Manchester Rock Band who have been said to be going many places. Their set is a must hear for any Heavy Rock fan, especially ‘Oceans’, their new single. Bury local lad Liam Marshall Barry and his band KC Grey will be taking the stage, a highly recommended Rock originals and covers band. The lineup also includes Bury Singer, Songwriter and Guitarists Gerry O Gorman of whom will be be providing a spark to the night with his brilliant humour and guitar/harmonica songs such as the acclaimed track “The Night I Met P J”. Plus performances from the amazing Sale Ladies Glasshouse Choir singing some special Rock Related songs for the event and finally ex boy band Superstar A.J. Valiant will be comparing the concert in his usual lively fashion. AJ will also be coming out of retirement to perform a couple of his amazing cover songs. 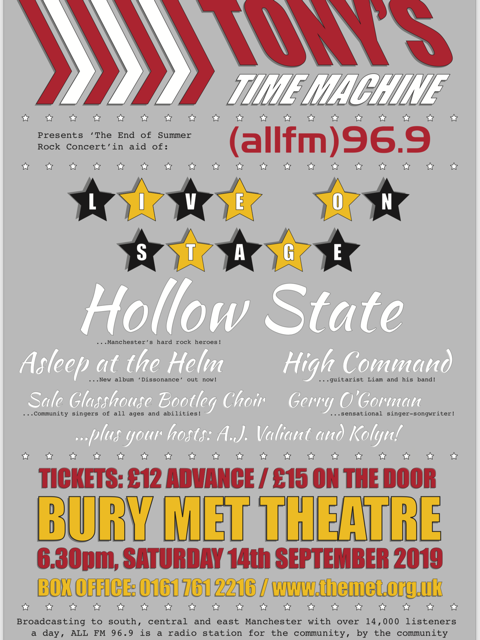 TonysTimeMachine (allfm) 96.9 presents this concert in aid of the charities, namely, Annabelle’s Challenge Bury, Stepping Stones Charity Bury & also ALL FM 96.9 Community Radio Charity.